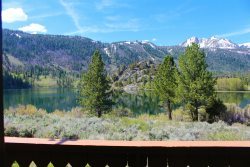 In the stunning mountain landscape of the Inyo National Forest around June Lake, it is easy to get overwhelmed with the many hiking trails available. We would like to share our favorite hikes from a local’s opinion and vantage point. 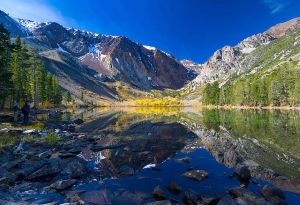 These day hikes vary in difficulty and showcase what our Eastern Sierra has to offer. Distance: 3.38 miles. Difficulty: Strenuous. The Fern Lake trail head is located on the June Lake Loop, about 1.5 miles from the village, close to Double Eagle Resort. You will see the trailhead sign from the road, Highway 158. Once you park, you will start ascending straight up the canyon. This hike is basically straight up to the lake and back down. Being very steep does has an advantage with views of the canyon as well as Silver, Gull, and June Lakes. This trail has a large waterfall about half way up. Once you arrive at the lake you can take in the high alpine scenery and fish for Brooke and Brown Trout. This trail offers a wonderful variety of wildflowers in late spring into summer as well as the gold and yellow foliage in the fall. Distance: 7.25 miles. Difficulty: Strenuous. This trail is a great way to get a peek of the back county in a day hike. Rush Creek Trail starts at Silver Lake, by the Frontier Pack Station and ascends the granite ridge that towers over Silver Lake. This hike takes one by Horsetail Falls, following a path of wildflowers. You also cross paths with an old Edison train track used to bring supplies up the mountain when the dam was being built. The water from Agnew and Gem Lakes were formed by Edison and the L.A. Department of Water and Power. From these high county lakes the water falls into Rush Creek, Silver Lake and eventually Grant Lake. If you hike up to Gem and Agnew and live in Southern California, you can view the source of your water. Once you get to Agnew it is another 2.5 up to Gem. There are alpine meadows and powerful, untouched mountains such as the Mount Ritter and Mount Banner. Distance: 4 miles. Difficulty: Easy. This is a popular hike because almost anyone can do it. To get to the Parker Lake Trail trail head, look for the sign located on the north end of the June Lake Loop, by Grant Lake. Follow the mellow dirt road until it ends at the trailhead. From the parking lot you start a gradual ascent. For the first half mile you are ascending, then the rest of the hike is basically flat, following Parker Creek. When you enter the aspen forest you will come out by the lake. This lake has glacier peaks shooting straight up from the water. Parker Lake is a great place to spend the day fishing trying your luck on Rainbow, Brown and Brooke Trout. This is also a wonderful hike in the fall. On the way back down you have sweeping views of Mono Lake and the Mono Craters. Distance: 3 miles. Difficulty: Moderate. Lundy Canyon Trail is by far one of the most alive scenic hikes you could go on in the Eastern Sierra. Go north of Lee Vining about 7 miles and go left when you see the Lundy Lake sign. Follow this road past the lake. It will turn into a dirt road following many shallow ponds and beaver damns. The dirt road ends at the trailhead. Please keep in mind this trail crosses paths with many creeks so wear shoes you do not mind getting wet. Right from the beginning of the hike you will start to see various kinds of wildflowers. If God had a garden, it would look like Lundy Canyon. From the aspens and wildflowers you gradually ascend until you come upon a large waterfall. Continuing up the trail you follow a stream that comes from many shallow, moss filled beaver ponds above. As you continue up there is another waterfall and more ponds; if you keep hiking up you will arrive at the 20 lakes basin, just outside Yosemite. Lundy in the fall will take your breath away. The whole mountain side is gold and yellow, reminding wildlife and visitors that the summer was grand, but winter is coming. Distance: 4.9 miles. Difficulty: Easy. 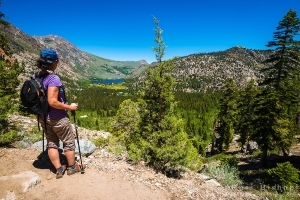 This is another great day hike that puts you in stunning scenery that places you well into the High Sierra back county. To get to 20 Lakes Basin Trail, take the 395 North to Tioga Road. Go up Tioga Road until you see Saddlebag Lake sign on your right. Park at the end of the dirt road. In the summer there is a marina and water taxi. To save about 3 miles of hiking take the water taxi across Saddlebag Lake. Helpful employees will give out maps and answer any questions you may have. Once off the boat you can start your loop hike, either direction is fine. On this easy hike you will see nine lakes all with unique landscaping. Because of the elevation, 10,000 feet, wildflowers can be spotted all the way into July and August. The trail is constantly changing from green grass meadows, to lush wildflower gatherings, to small lakes tucked in large granite rocks. If you want to see what Yosemite looks like without the crowds and fees, this is the hike for you.